RiverChase has three swimming pools, one indoor and two outdoor. There are large slides, smaller water playgrounds for children and certified Lifeguards always on duty. 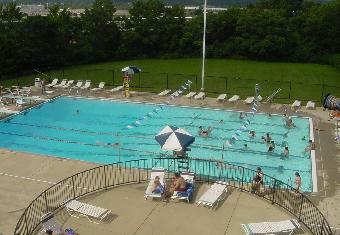 RiverChase pools are for the aquatic enjoyment of our members and guests, young and old alike. Click the links below for more general information. Please review our pool rules and regulations before planning your visit to RiverChase. Here are some important pool reminders. - Children must be at least 48 inches tall to use the big slides. - Swim wear having zippers, rivets or buckles will not be permitted to use the slides. - No outside food, beverages or coolers allowed. - ALL toddlers must wear a swim diaper along with a swimsuit. - Swimmers must wear proper swim wear. ONLY swimsuits with liners. NO gym/basketball shorts, cutoffs, sports bras etc. will be allowed. RiverChase offers many different aquatic programs/activities for all ages. Click the links below for more information about each. You can also check out the current issue of the Beacon for seasonal information.